Tue., May 31, 2016, 12:46 p.m.
WASHINGTON – After carefully avoiding any involvement in the Democratic presidential primary, California Gov. Jerry Brown dropped his neutrality – and looked past his bitter history with the Clintons – to endorse Hillary Clinton on Tuesday. In an open letter to Democrats and independents, Brown urged voters who do not want to see a Donald Trump presidency to stop the infighting and rally behind Clinton, the Democratic front-runner. Brown said Clinton has made a persuasive case that she is capable of pushing forward a progressive agenda, and her lead over rival Bernie Sanders is so large at this point that the insurgent Vermonter no longer stands any realistic chance of winning the nomination. The endorsement comes as a recent poll showed Sanders and Clinton in a dead heat in California, which holds its primary June 7. Clinton cut short a planned campaign swing through New Jersey so she could get back to California by Thursday and hit the stump for several days. It was that year that Brown played a role not unlike the role Sanders is playing now, running as the outsider against the establishment, demanding the Democratic Party move in a more leftward direction and refusing to yield to the front-runner at a time party leaders were eager for unity. The uneasiness still had not subsided by the time Brown had launched his campaign for governor, in 2010. His GOP rival at the time, Meg Whitman, quoted Bill Clinton to make her case that Brown had raised taxes during his first stint as governor. Brown responded by pointing out that Bill Clinton lied about his philandering in the White House, mocking Clinton’s notorious “I did not have sexual relations with that woman” line. Brown later apologized. And Bill Clinton ultimately endorsed his gubernatorial bid that year. The governor worked hard to stay on the sidelines after Hillary Clinton launched her White House bid last year. But he eventually invited former President Clinton to visit him in the refurbished governor’s mansion. The two denied talking about Hillary Clinton’s White House run, but they didn’t need to have that conversation. It was obvious that was why they were burying the hatchet. There are any number of reasons why it is a smart move, politically, for Brown to throw his support behind Clinton at this point, regardless of whether animosity between the two big personalities remains. California needs an ally in the White House. The Sanders run has become quixotic. Trump’s agenda could be more disruptive to California than any other state. 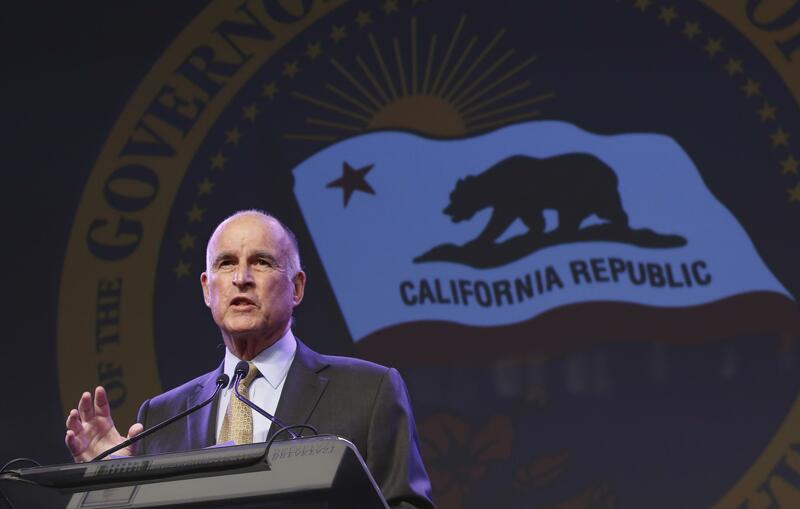 The presumptive GOP nominee is looking to roll back many of the California policies that Brown’s legacy has been built on, particularly those involving rights for migrant workers and combating climate change. Trump “has called climate change a ‘hoax,’” Brown warned in his letter. “He has promised to deport millions of immigrants and ominously suggested that other countries may need the nuclear bomb. “I want to be sure it is Hillary Clinton who takes the oath of office, not Donald Trump,” Brown wrote. Published: May 31, 2016, 12:46 p.m.